Why do turkeys vote for Christmas? The North East, Cornwall and the Welsh valleys voted overwhelmingly in favour of Brexit. These are the poorest regions in Britain, and as such have been the beneficiaries of huge amounts of EU funding through the EU Structural Investment Fund. The EU identified West Wales and the valleys region as the poorest in the whole of North West Europe, and then used the Structural Adjustment Fund to assign the area a whopping £1.8 billion to finance infrastructure improvements, new facilities and improved services in an attempt to revitalise the economy and attract businesses investment, yet the people of Ebbw Vale voted 62% in favour of Brexit, the highest leave vote in the whole of Wales. 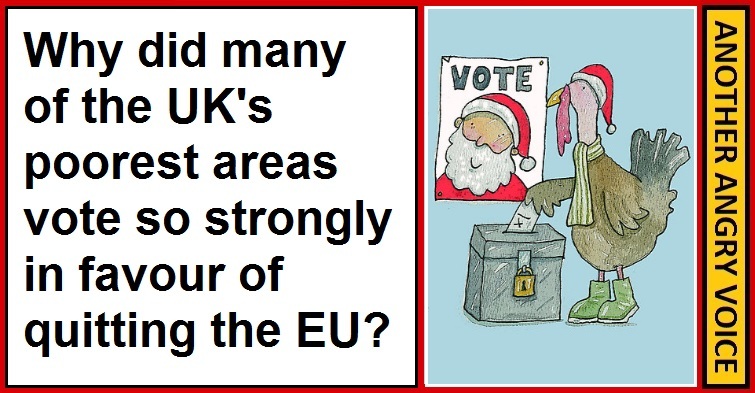 The North East and Cornwall have also benefited enormously from the EU Structural Adjustment Fund, yet there too people flocked to the polling stations to vote to have these funds cut off. 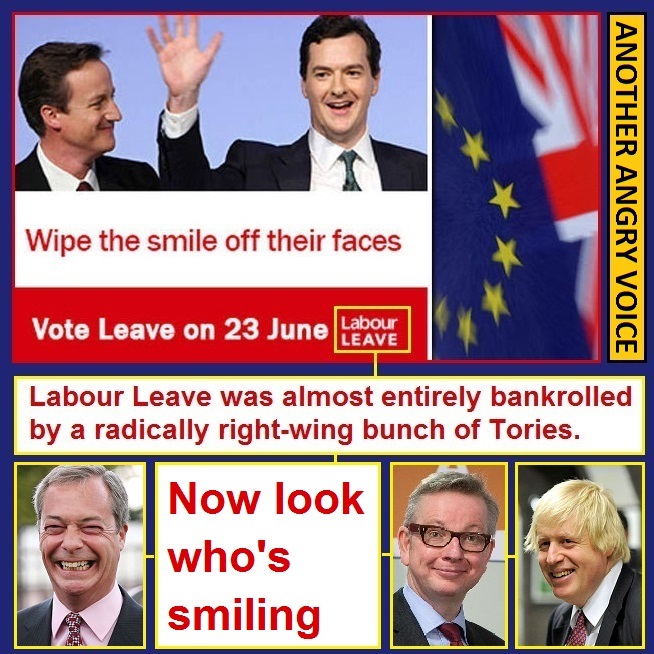 As a result of the vote for Brexit the Tory government is due to lurch even further rightwards from the austerity fetishist, NHS wrecking, local authority starving, education system vandalising, upwards wealth distributing, privatise everything ideological extremism of the last six years. The idea that an even more radically right-wing "leave it to market forces" Tory government is going to decide to replicate the EU funding to these deprived regions rather than distribute the cash towards corporations and the super-wealthy minority who make up the vast majority of their party donors is so utterly delusional that surely nobody could believe it. The Tories have spent the last six years imposing such severe cuts to local authority funding that even David Cameron's local council were reduced to pleading with him to consider the damage he's doing. Surely it should be common knowledge that the Tories have reserved all of their harshest local authority cuts for the poorest and most deprived areas in the UK? If the much less severe cuts to Tory councils has them squealing for mercy, just imagine how bad the significantly more brutal cuts are in the most deprived regions of the UK. The Tories knew that Brexit was going to lead to severe economic turmoil and another gaping hole in their budget, but Iain Duncan Smith assured us that several more years of savage Tory austerity would be "a price worth paying" to achieve Brexit. We all know why he thought it was a reasonable price to pay; he liked the price because it's not going to be paid by people like him, it's going to be paid by the sick and disabled, the working poor and people in the poorest areas of Britain who will see even more cuts to their local services that have already been stripped down to the bones after six years of malicious Tory cuts. It's hard to fathom the thinking of people who have just voted to turn off the supply of EU funding to their regions, and subject themselves and their communities, and the rest of us an even more brutally right-wing Tories. It looks an awful lot like turkeys voting for Christmas, and it would be easy to dismiss Brexit voters in the poorest areas as merely being hopelessly gullible tabloid reading idiots who let a bunch of psychopathic right-wing press barons who don't even live or pay tax in Britain (Rupert Murdoch, Jonathan Harmsworth, the Barclay brothers) convince them to vote against their own economic interests. It would be easy to say that these people are stupid as hell and thoroughly deserving of what's coming to them, but it wouldn't be useful. The huge groundswell of support for Brexit in these deprived areas is undeniably a shocking display of economic self-harm, and it's easy to glibly attribute it to stupidity, but it's clearly no coincidence that so many of the poorest areas of all were also the ones that voted the most strongly for Brexit. Something other than stupidity drove these people to act in this way, and desperation and unfocused anger look like likely candidates. The hard-right economic dogma that every Westminster government since 1979 has subscribed to has left these areas rotting at the margins. For every £1 of infrastructure spending per person in the north east, London gets £24. As vital as the EU Structural Adjustment Fund cash has been to Britain's most deprived areas, it's still nowhere near enough to make up for epic disparities like that. After six years of brutal Tory austerity, much of it deliberately targeted at the poorest areas of the country, it's no wonder that these places were full of people who were absolutely livid with the status quo, and when, for once in their life they were given an opportunity to vote on something that actually mattered, they lashed out at David Cameron and George Osborne. The Labour Leave movement fed into this anger by deliberately casting the referendum as an opportunity to punish David Cameron and George Osborne (see image), but it's now become undeniably clear that Labour Leave was completely funded by hard-right Tories, so this ostensibly left-wing "give the Tory toffs a kicking" propaganda was actually paid for by a different, even more rabidly right-wing bunch of Tories seeking to steal Cameron's place at the top table. The Guardian wrote an article about how Ebbw Vale ended up voting to turn their noses up at hundreds of millions of pounds of EU funding, and one of the guys they interviewed gloried in the fact that "David Cameron got a good kicking" as if seeing a guy who is set to remain a multi-millionaire toff for the rest of his life forced to resign a few years earlier than he'd planned to, is somehow adequate compensation for the fact that his community is now going to be so much worse off. I guess the conclusion is that when people allow unfocused anger to dictate their actions they can end up making awful decisions. It really didn't take much mental effort to figure out that the Vote Leave campaign was founded on blatant lies, immigration fearmongering, false promises and the strategy of presenting the referendum decision as a "simple problem - simple solution" choice, when it was actually the most complex multi-layered consideration anyone in the UK (outside of Scotland) has been presented with in decades. Apparently a lot of people just wanted to lash out at the establishment powers that had spent the last four decades grinding their communities into the dirt, and they didn't give much thought to the actual consequences of their votes would be. I'm not tempted to gloat at the stupidity of "Turkeys voting for Christmas", because I'm all too aware that the consequences are going to be appalling for an awful lot of people. 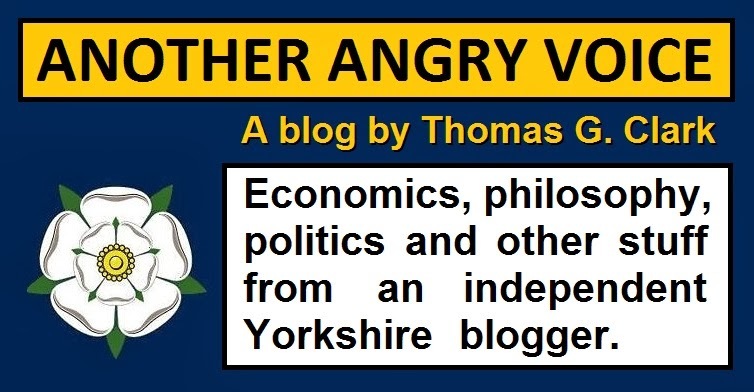 Many of the wealthier, more highly educated people who voted Remain will no doubt be insulated from the worst of it by virtue of the fact that they're not the traditional victims of Tory ideology. And many of the poorer, less educated people who voted for Brexit will undoubtedly suffer the worst of the Tory ideological rampage that is set to come. But there's no justice in that because there is no justification for hard-right Tory fanaticism, even if the victims brought it upon themselves because they allowed themselves to be misdirected into angrily lashing out in the wrong direction. Is this the last stand of the Blairites? Why the Article 50 foot dragging? How does the case for "Lexit" stack up? Is this Thomas Mair at a Britain First protest? What is ... synthetic outrage? Why do people who like the NHS vote Tory? What is in the Brexit "mystery box"
Why are so many Brexiters so angry?